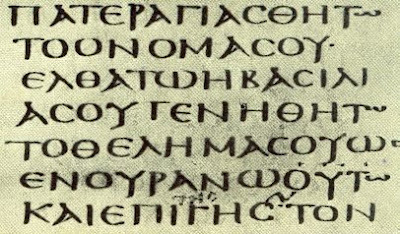 (Image: a photograph of a page from Codex Sinaiticus, one of the most important ancient copies of the Bible). As you may have noticed, the name of this blog has been changed. Henceforth it shall be known as, The Sacred Page. "For the Sacred Scriptures contain the word of God and since they are inspired really are the word of God; and so the study of the sacred page is, as it were, the soul of sacred theology" (Dei Verbum, 24). In fact, the term sacra pagina or "the sacred page" has long been used in Christian tradition to emphasize the theological dimension of Scripture. Hence, for Thomas Aquinas, "the study the sacred page" was simply another way of describing the science of theology. The name is therefore significant. Here of course we are interested in the the study of Scripture. Many of the posts apply historical methodology and speak to critical issues involved with exegesis. However for the writers of this blog, exegesis and theology are not two disconnected fields, they are interrelated. We recognize Scripture as something more than mere ancient literature; it is the inspired Word of God. 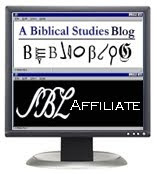 The name of the blog therefore hopefully underscores its contributers approach to biblical studies, using a phrase which emphasizes our commitment to Catholic magisterial teaching. The name also has the advantage of containing the word "page"--a word especially appropriate for a website! Be assured though that the title refers to Scripture, not this blog! Indeed, the name change has been long overdue. When I began this blog it was primarily for a popular audience. However as I've moved through my doctoral work the posts here have become increasingly more academic in tone. "Singing in the Reign" began to feel a little inappropriate. When my good buddy Brant Pitre began contributing to this blog in February 2007, I felt an even greater need for a name change. Brant Pitre is of course an extremely well-regarded scholar. It seemed a little silly that a guy who had published a hugely significant dissertation with the prestigious German publishing house, Mohr Siebeck, would write for a blog entitled, "Singing in the Reign". I felt bad about asking him to shoulder such a silly blog name. Being the good friend that he is, Brant just rolled with it. But ever since he began writing here I knew I would have to change the name of the blog. This felt-need to change the title of the blog has been especially reinforced of late by another impending development. Another extraordinarily talented, up-and-coming biblical scholar is about to join us here on this blog--John Bergsma. John received his doctorate at Notre Dame, where he specialized in the Old Testament and the Dead Sea Scrolls. His dissertation, The Jubilee from Leviticus to Qumran: A History of Interpretation (2006) is now published by the extremely prestigious academic publisher, Brill. The work is really the definitive monograph on the Jubilee. John of course has also published articles with well-known academic journals. Like Scott Hahn and Brant Pitre, John has a unique ability to make the complex understandable. In fact, this weekend I was with him at the Word of God Conference in New Orleans and heard him give two absolutely amazing presentations to a crowd of mostly lay people and priests. Suffice it to say, John is a rare gem. Again, I 'll have more to say about John in another post. Suffice it to say, this blog has outgrown its old title. With that let me welcome you to www.thesacredpage.com. Now, please go and spread the word! I like the name: It is more scholarly. I like the new look too. Congratulations! By the way, did you know that the British Library has a Turn The Page version of the Codex Sinaticus on its Web site? With an audio commentary as well? It's fascinating.